NORRIS (British). ). "Northerner" (Old French) or ). "nurse" (Old French). Isaac Allerton was a Mayflower passenger. "He may have been with the Pilgrims in Amsterdam about 1610, and earlier as a merchant in Holland, but most likely he joined the Robinson church with others from London. It is known he was of London before 1609, and thet he was admitted as burgess of Leyden, Holland, in 1614. "His son Bartholomew returned to England, married and became a preacher. No doubt much of his education was obtained through the teaching of William Brewster, who also later on, brought up and prepared his brother Isaac, Jr., for Harvard. He appeared to have been a merchant tailor. His name is first recorded in Leyden with that of a widowed sister Sarah (Allerton) Vincent, also of London, who married Degory Priest Nov. 4, 1611. His own marriage to Mary Norris took place at the same time. The Allerton family is old and honorable in England, a mixture of Saxon and Danish. There is a fine coat of arms in the Heraldic College at London. "Allerton" is the name of a parish in north Yorkshire. "Like most of the Mayflower group born in the sixteenth century, Allerton was an ambitious man striving to succeed in a business way, and his associates had a profound respect for his judgment. ... Among several outstanding characters associated with the Mayflower Planters, Isaac Allerton holds a very unique position. His vision was somewhat broader than any of the others, especially in the matters of commerce, and his immediate contemporaries were quick to take advantage of his exceptional abilities. "A Leiden separatist and 1620 Mayflower passenger, Allerton was second in authority only to Bradford in the early years of the colony. However, Bradford felt that Allerton had abused the trust the colonists placed on him, and Allerton left the colony in the 1630s for other parts. A most enterprising man, he engaged in commercial pursuits at Marblehead and in Maine and later resided at New Amsterdam. Birth: Perhaps around 1590. Her marriage record says she was from Newbury, England. * Isaac Allerton, 4 November 1611, Leiden, Holland. Death: 25 February 1620/1, Plymouth. Children: Bartholomew, Remember, Mary, an unnamed child buried in Leiden, Holland, and an unnamed son stillborn in Plymouth Harbor. Mary Norris was probably about 30 years old when she came to Plymouth on the Mayflower in 1620, estimated from the known age of her husband, and on her known marriage date. She married Isaac Allerton in Leiden, Holland in 1611, one of the first marriages amongst the Pilgrims after they had fled to Holland from England. Her marriage record indicates she was from Newbury, perhaps Newbury, Berkshire, England. She had children Bartholomew, Remember and Mary in Leiden, all of whom came on the Mayflower with her. She and Isaac buried a child, not yet named, at St. Peters, Leiden on 5 February 1620, and she gave birth to a stillborn son ten months later, on board the Mayflower in Plymouth Harbor, on 22 December 1620. Mary died on 25 February 1621, during the height of the first winter when half the Mayflower passengers and crew died. Her husband Isaac, and her three children Bartholomew, Remember, and Mary, all survived, however. Isaac would later remarry to Fear Brewster, daughter of Plymouth's Elder William Brewster. * Mrs. Mary (Norris) Allerton, from Newbury, co. Berkshire, England. * Bartholomew Allerton, about 7-years old. * Remember Allerton, about 5-years old. * Mary Allerton, about 3-years old. As the Mayflower left England for America, there were 18 adult women onboard. Three of them, Elizabeth Hopkins, Susanna White, and Mary Allerton, were actually in their last trimester of a pregnancy. All the adult women on the Mayflower were married, there were no single women--although there were a few teenage girls nearing marriageable age. William White, William Mullins, "with two more": February 21, Ibid., p. 32. Mary Allerton: February 25, "Dies Mary, the wife of Master Isaac Allerton," Ibid. N.B. This month, Seventeen of our number die. * Mary Norris, 4 November 1611, Leiden, Holland. * Fear Brewster, c1626, Plymouth. * Joanna Swinnerton, between 1634 and 1644, possibly at Marblehead. Death: Between 1 and 12 February 1658/9, New Haven. Children by Mary: Bartholomew, Remember, Mary, an unnamed child buried in Leiden, Holland, and an unnamed son stillborn in Plymouth Harbor. On 18 June 1618 in Leyden, Isaac Allerton, tailor, made a sworn statement for Nicholas Claverly, witnessed by Degory Priest. On 9 January 1619, Isaac Allerton made agreement with Alice Gallant, widow of John Hooke and current wife of Henry Gallant, to apprentice her twelve-year old son John Hooke to Isaac Allerton, to learn the tailor trade. John Hooke came with Isaac on the Mayflower, but died the first winter. December 2, 1633 (PCR 1: 20) *Decbr 2d. Whereas Mr Will Bradford was appointed, in the behalfe of the Court, toenter upon the estate of Godbert Godbertson & Zarah, his wife, & to discharge the debtes of the said Godbert, so far as his estate will make good; and whereas the greatest pt of his debtes are owing to Mr Isaack Allerton, of Plym., mercht, late brother of the said Zarah, the said Isaack hath giver free leaue to all other his creditors to be fully discharged before he receiue any thing of his pticular debtes to himselfe, desiring rather to lose all rather then other men should lose any. Isaac Allerton died early in the year 1659. He was buried in the old Burying Ground at New Haven that occupied the square in the heart of the present city upon which stands the Old State House and three churches. No monument or gravestone have been found. The burgomasters of New Amsterdam appointed Allerton's son, and his business associates, Loockermans, Leendertsen, George Woolsey, and John Lawrence to be curators of his trading business which included ships, warehouse and real estate in New Amsterdam. In spite of his reputation as one of New England's wealthiest merchants, Allerton died insolvent with debts to creditors located in many of the ports in which he traded. Allerton's son purchased his father's New Haven home from his creditors and deeded it to his stepmother, Joanna, in 1660. Joanna died in 1682. The home was taken down in 1740. 156 Isaac Allerton's Will and Inventory. Sometime before 1644 Allerton married his third wife, Joanna Swinnerton in New Haven. Joanna is believed to be the widow of Job Swinnerton, admitted to Salem in 1637. In 1646, Allerton asked Bradford, Brewster, Winslow and Standish to be his agents and sell his lands, goods and cattle to clear all his debts and demands of the undertakers that were uncovered in 1630/31. In 1646 Allerton became a permanent resident of New Haven where he and his wife lived for the remainder of his life except for trading voyages and occasional visits to his warehouse in New Amsterdam. 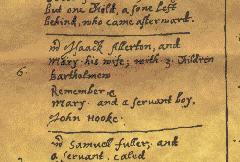 In March 1647 Isaac and Joanna were assigned seats in the New Haven meeting house. He built a stately home with four porches and many fireplaces on two acres of land on the creek on the northwest corner of Union Street between Cherry Street on the north, and Fair Street on the south. The home was located among the grand homes of Davenport, Eaton and other original New Haven settlers. In 1661 Allerton's widow, Joanna sheltered Edward Whaley and William Goffe, the Regicide Judges who sentenced Charles I to be beheaded and who were now being pursued by the agents for Charles II to be returned for trial in England. We have received your letters both by the Anne and the James, which are both safely arrived here, thanks be to God, the Anne about the later end of July, and the James a fortnight after, and by them a large and liberal supply, for which together with your loving and honest letters we give you hearty thanks, being very sorry to hear of your losses and crosses, and how you have been turmoiled thereabout. If God had seen it good we should have been right glad it had come sooner, both for our good and your profit; for we have both been in a languishing state; and also fain to put away our furs at a small value to help us to some necessaries, without which notwithstanding we should have done full ill, yea indeed could have not subsisted; so as we have little or nothing to send you, for which we are not a little sorry; but if you knew how necessarily we were constrained too it, and how unwillingly we did it, we suppose you cannot at all blame us for it; we put away as much at one time and other of beaver as, if they had been saved together and sold at the best hand, would have yielded 3 or 4 hundred pounds; and yet those are nothing to those we have lost for want of means to gather them when the time was, which I fear will scarce ever be again, seeing the Dutch on one side and the French on the other side and the fishermen and other plantations between both, have and do furnish the savages, not with toys and trifles, but with good and substantial commodities, as ketkles, hatches, and clothes of all sorts; yea the French do store them with Biscay shallops fitted both with sails and oars, with which they can either row or sail as well as we; as also with pieces, powder and shot for fowling and other services; (we are informed that there are at this present a 100 men with 8 shallops coming from the eastward, to rob and spoil their neighbors westwards); also I know upon my own knowledge many of the Indians to be as well furnished with good ketkles, both strong and of a large size, as many farmers in England; yet notwithstanding we shall not neglect to use the best means we can with the pinnace and means we now have, both for trading or any other employment the best we can for both your and our advantage; but we are sorry that she is manned with so rude a crew of sailors; we hope the master is an honest man; and we find the captain to be a loving and courteous gentleman; yet they could not both of them rule them, so as we were fain to alter their conditions and agree with them for wages as well as we could; and this we did not only by the captain, and masters, together with Mr. Pierce's advice, but we saw we were of necessity constrained thereunto to prevent further mischief, which we saw would unavoidably ensue; for besides the endangering of the ship, they would obey no command, at least without continual murmuring, alleging that they were cousined and deceived and should sail and work for nothing, the which they would be hanged rather than they would do, as also that they would not fish, or do any such thing; they said they were fitted out for a taker, and were told that they might take any ship whatsoever that was not too strong for them, as far as the west Indians, and no other employment would they follow; but we doubt not now to have them at a better pass, and hope to raise some benefit by her employment; she is now to go to the southward; we have sent to the Indians, and they promise us we shall have both corn and skins; at her return we think to send her northward, both to fish and truck, if it please God to bless them. We have sent unto you (with these our letters) one of our honest friends, Edward Winslow by name, who can give you better and more large information of the state of all things than we can possibly do by our letters; unto whom we refer you in all particulars; and also we have given him instruction to treat with you of all such things as concern our public good and mutual concord; expecting his return by the first fishing ships. We have written to the counsel for another patent for Cape Anne to wit for the westerside of it, which we know to be as good a harbor as any in this land, and it thought to be as good fishing place; and seeing fishing must be the chief, if not the only means to do us good; and it is like to be so fit a place, and lieth so near us, we think it very necessary to use all diligence to procure it; and therefore we have now written unto you and the counsel again about it, lest our former letters should not be come, or not delivered, of which we have some suspicion; Mr. Weston hath written for it, and is desirous to get it before us; and the like doth Mr. Thomson; which is one special motive that hath moved us to send over this messenger fore-named; as also about that grand patent which we understand you got from Mr. Pierce, which if it be as we have it is by Mr. Thomsons relation, but to go by a right line from the Gurnatsnose due west into the land a certain way, and no further northward, it will strip us of the best part of the bay, which will be most commodious for us, and better then all the rest; therefore seeing now is the time to help these things we thought it were then necessary to send about the former patent for Cape Anne; we desire it may be procured with as ample privileges as it may, and not to be simply confined to that place, but in our liberty to take any other, if we like it better. Mr. Pierce (for ought I hear) hath used our passengers well, and dealt very honestly with us; but we wanted a perfect bill of lading, to call for each parcel of our goods, which as you have occasion we pray you see to hereafter, for it is very requisite though you have to deal with honest men. We have agreed with him to lade him back for a 150 pounds, which you will think something much, but we could get him no cheaper; we did it the rather that he might come directly home, for the furtherance of our other affairs; as also for some other respects necessary and beneficial for us; we have laded him with clapboard, the best we could get, which we hope at least will quit the cost; for lengths they are not cut by the advice of the cooper and pipestaffmaker which you sent us; for thickness they are bigger than those which come from other places, which must accordingly be considered in the prices; the cooper of the ship saith they are worth 5 per 100 and I hear he means to buy some of them of you; of which I thought good to give you notice. We have also sent you that small parcel of furs which we have left, besides those we put away formerly; if the ship had but come one month sooner, we had sent you a good many more, though since that conspiracy raised against us by the Indians, caused by Mr. Weston's people, and that execution we did at the Massachusetts, chiefly for the saving of their lives, we have been much endamaged in our trade, for there where we had most skins the Indians are run away from their habitations, and set no corn, so as we can by no means as yet come to speak with them. We have taken up of Mr. Pierce sundry provisions, the chief whereof is bread, and course cloth, and some other needful things withal; and with them he hath put upon us some other things less necessary, as beef etc. which we would not have had if we could have had the other without them; fear of want again before supply come to us, as also a little to encourage our people after their great disheartening hath made us presume to charge you herewith; a bill of the particulars we have here sent you; we hope the furs will defray it. It is for certain that great profit is here raised by fishing; the ships have this year made great viages, and were a great many of them; and if we could fall once into the right course about it, and be able to manage it, it would make good all; a good fishing place will be a great advantage for it, where the boats may go quickly in and out to sea at all times of the tide, and well stowed with fish near at hand, and convenient places to make it, and build stages in, and then it will not only serve for our own fishing, but after it be known once by experience to be a place well qualified for that purpose, benefit will be made of it by granting licence to others to fish there. But about these things we refer you for further information to our messenger and Mr. Pierce, who is a man we perceive very skillful and diligent in his business, and a very honest man, whose employments may do us much good; and if you resolve, as we earnestly desire you may, of any course about fishing we think he is as fit an instrument as you can use. It would be a principal stay and a comfortable help to the Colony if they had some cattle, in many respects. First it would much encourage them, and be in time a greater ease both for tillage of ground, and caring of burden; 2ly, it will make victuals both more plentiful, and comfortable; 3ly, it will be a good benefit after some increase that they might be able to spare some to others that should have thoughts this way; especially goats are very useful for the first, and very fit for this place, for they will here thrive very well, are a hardy creature, and live at no charge, either winter or summer, their increase is great and milk very good, and need little looking to; also they are much more easily transported and with less difficulty and hazard, than other cattle; yet two of those which came last died by the way, but it was by some negligence. For kine and other cattle it will be best when any comes that it be in the spring, and if they should come against the winter, they would go near to die; the Colony will never be in good estate till they have some. As touching making of salt we have by accident had speech with one of the north country, who came with Mr. Reynolds (who put in here), and was his mate; he had speech with our smith about the making of salt pane, which doubts he cannot do it; also he saith if they go about it that have no skill they will quickly burn the pans and do no good, whereas if they be skillfully ordered they may last a long time. He thought we might have some from about Newcastle that would best fit our turn for that business we pray you provide for us here about as soon as you can, that we may do some thing to the purpose. the head of one of them stands still on our fort for a terror unto others; they met our men in the field and shot at them, but thanks be to God not a man of them were hurt; neither could they hurt the Indians with their pieces, they did so shelter themselves behind great trees, only they broke the arm of a notable rogue as he was drawing his bow to shoot at Captain Standish, after which they came away. We gave the Captain order, if Mr. Weston's people would, that he should bring them to us and we would afford them the best succor we could, or if they chose rather to go to Monhiggan, that then if he took any corn from the Indians, he should let them have to victual them thither (which accordingly was done, though ours had scarce enough to bring them home again). Yet for all this, and much more they cannot afford us a good word, but reproach us behind our backs. Touching our government you are mistaken if you think we admit women and children to have to do in the same, for they are excluded, as both reason and nature teacheth they should be; neither do we admit any but as are above the age of 21 years, and they also but only in some weighty matters, when we think good; yet we like well of our course, and advice propounded unto us, and will as soon as we can with convenience bring it into practice, though it should be well it were so ordered in our patent. with it. As for Captain Standish we leave him to answer for himself; but this we must say, he is as helpful an instrument as any we have, and as careful of the general good, an doth not well approve himself. Indeed friends it doth us much good to read your honest letters. We perceive your honest minds, and how squarely you deal in all things, which giveth us much comfort, and howsoever things have been for time past, we doubt not for time to come but there shall be that good correspondence which is meet. And we shall labor what we can to be answerable to your kindness and cost. For our friends in Holland we much desired there company, and have long expected the same; if we had had them in the stead of some others we are persuaded things would have been better than they are with us, for honest men will ever do their best endeavor, whilst others (though they be more able of body) will scarce by any means be brought to; but we know many of them to be better able, either for labor or counsel then ourselves; and indeed if they should not come to us, we would not stay here, if we might gain never so much wealth, but we are glad to take knowledge of what you would write touching them, and like well of your purpose not to make the general body bigger, save only to furnish them with useful members, for special faculties. Touching those articles of agreement, we have taken ourselves bound by them unto you, and you unto us, being by Mr. Weston much pressed thereunto, we gave Mr. Cushman full commission to conclude and confirm the same with you. For anything further thereabout we refer you to our messenger; though in any bound made, or to be made between you and us, we take our friends at Leyden to be comprehended in the same, and as much interested as ourselves; and their consents to be accordingly had; for though we be come first to this place, yet they are as principal in the actions and they and we to be considered as one body. We found the surgeon in the pinnance to be so proud and quarrelsome a man, and to use his terms in that sort, as the Captain and others durst not go to sea with him; being over ready to raise factions and mutiny in the ship; so as we were constrained to dismiss him, and hire Mr. Rogers in his room, Mr. Pierce being willing to release him, to do us a favor. He is to have 35s per month, whereof he desires his wife may have 16s a month, which we pray you may be accordingly performed. About Hopkins and his men we are come to this issue. The men we retain in the general according to his resignation and equity of the thing. And about that reckoning of 20 odd pounds, we have brought it to this pass, he is to have - 6 - " - paid by you there, and the rest to be quit; it is for nails and such other things as we have had of his brother here for the company's use, and upon promise of payment by us, we desire you will accordingly do it. For the tokens of your love and other charges you have been at with myself, befit you many thanks, (and so do they likewise) not knowing how to recompense your kindness. It is more then we have deserved at your hands. Touching those which came to us in their particular, we have received them in as kindly manner as we could, according to our ability, and offered them as favorable terms as we could touching their footing with us. Yet they are sundry of them discouraged I know not whether by the country (of which they have no trial) or rather for want of those varieties which England affords, from which they are not yet weened, and being so delightful to nature cannot easily be forgotten without a former grounded resolution. But as they were welcome when they came, so shall they be when they go, if they think it is not for their good, though we are most glad of honest men's company; and loath to part from the same.